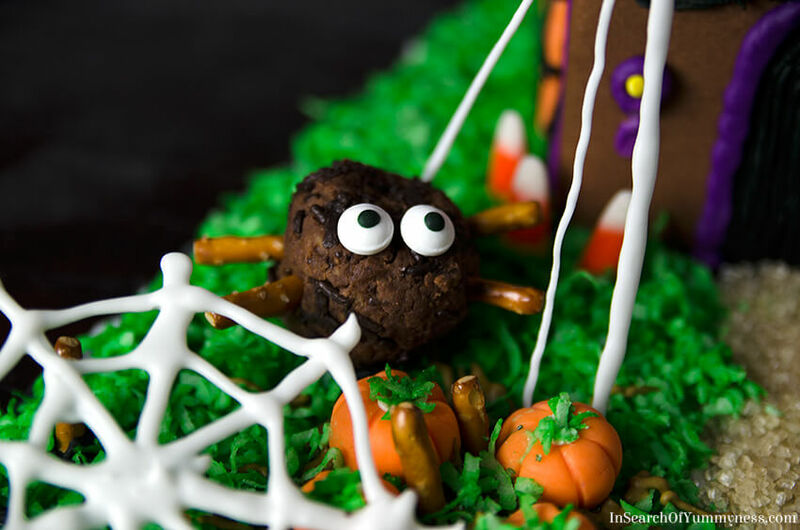 Get your cute on this Halloween with these adorable fudgey spider brownie bites! Halloween is coming up! Are you doing anything fun this year? 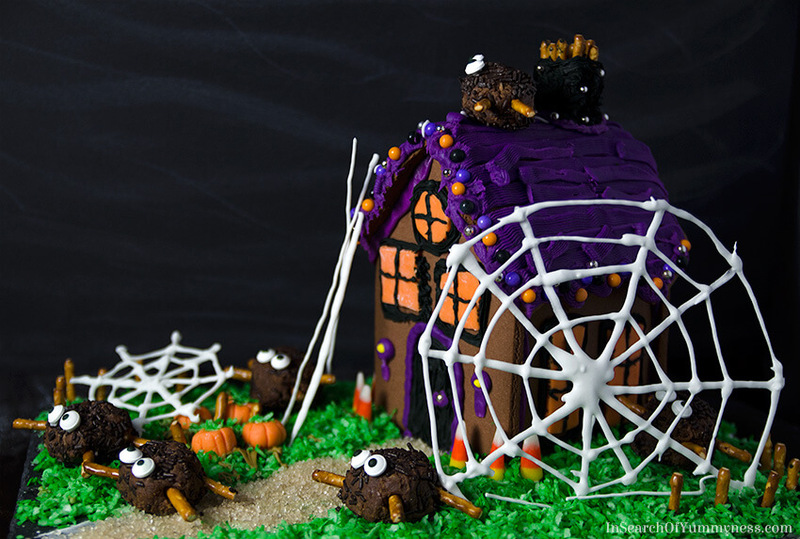 I’ve been playing with this Wilton Haunted Gingerbread House and nibbling on these fudgey Spider Brownie Bites! These little cuties are made with ingredients that are similar to the popular magic cookie bars, but the ingredients are mixed together and rolled into a ball, instead of being layered. The result is a chewy brownie bite that’s sure to squash your sugar cravings! I know that cutesy Halloween posts don’t really fit in with the rest of my content here on In Search Of Yummy-ness, but I can’t resist the chance to them. I’ve always loved cute and crafty Halloween things, and now that I’m not working in child care anymore I don’t really get any other opportunities to do this kind of stuff. So I’ll keep making spider brownie bites, and marshmallow bats and such until they stop being fun to make! I rolled out the balls and placed them onto parchment paper, then started decorating them one at a time. I found that if the mixture was too warm, the pretzels wouldn’t stay in at the angle that I wanted them to be. But then, if the mixture was too cold the sprinkles refused to stick on. You might need to play around with them to see what works best for you. If you figure out an easier way to decorate them, please let me know in the comments! Oh, another thing to note with the pretzel legs is that they lose their crunch after a couple of days. Actually, these spider brownie bites are best enjoyed on the day you make them. They will last for about 3 days in an air-tight container, but after that they will lose their texture. 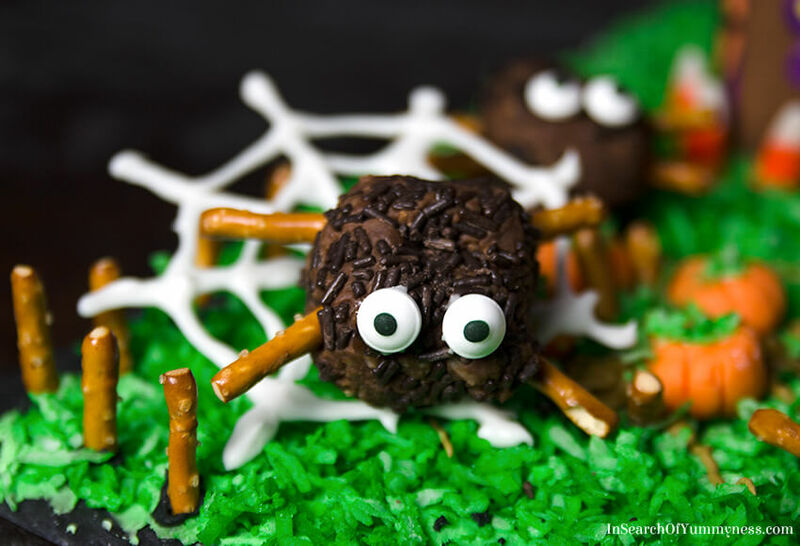 Of course you could make the brownie bites and skip the spider part all together. The prep would be a lot faster, and you could even stick them onto lollipop sticks for a quick party snack. Speaking of parties, I’m all partied out from last night. After being sick all week, and then finishing a long work day, I headed out to the Royal Ontario Museum with a friend for the Halloween edition of their FNL ROM events. I dressed up as Cleopatra (fitting for a museum right?) and spent the night wandering the exhibits and attempting to dance to the music the DJ was playing. But at least I’ve got photos of these cuties to cheer me up. 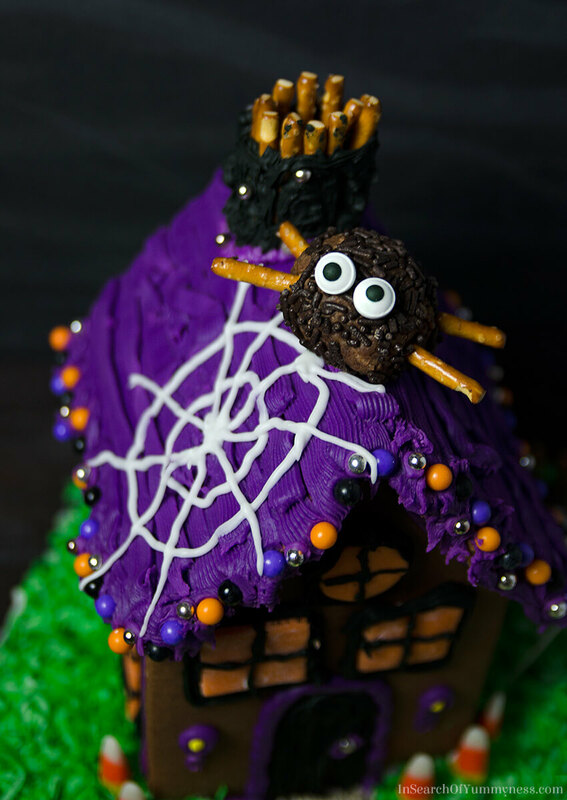 I’m kind of obsessed with how cute these spider brownie bites turned out, and don’t get me started on that Haunted Gingerbread House. I’m going to be so sad when it’s time to throw it out! My mom and I put the house together last weekend, and it’s holding up so far, but I know it won’t last forever. Oh well, we’ll just have to make a proper gingerbread house for Christmas this year. If you’re wondering what I used for the eyeballs on these spider brownie bites, they are the same Wilton candy eyeballs that I used on my marshmallow bats. If you can’t find those, you could just pipe on a bit of white royal icing for the eyes, let that dry, then pipe on a tiny bit of black royal icing for the pupils. The pre-made eyeballs are just a lot faster, so that’s why I like to use them. The edible glue I used to attach the eyes to the bats didn’t work on these brownie bites, so I used royal icing as the glue instead. I think that actually works better in both cases, to be honest. This is one recipe where it helps to use a food processor, or a mini food chopper, to decrease your prep time. The cookie crumbs can be made in minutes by giving store-bought shortbread cookies a whirl in the machine, and you can also use it to quickly chop up the pecans. Feel free to swap ready-made graham cracker crumbs for the cookie crumbs, and either omit or swap out the nuts as needed. The recipe is pretty flexible that way. You should also note that the mixture won’t be dark brown in colour until you bake it and mix the (now melted) chocolate chips in with everything else. I used semi-sweet chocolate chips for this recipe, but you can substitute milk chocolate chips or even dark chocolate chips if you like. I hope you try making these chewy fudgey spider brownie bites! If you’ve got a favourite treat that you like to make for Halloween, let me know in the comments below! These chewy fudgey spider brownie bites are made with ingredients that are similar to the popular layered magic cookie bars. Brush an 8-by-8-inch baking pan with melted butter, and set aside. Combine the cookie crumbs, coconut, pecans, condensed milk, chocolate chips and salt in a medium bowl. Use a wooden spoon to stir the mixture until combined. Transfer the mixture to the prepared pan and press it down into the edges. Bake until the chocolate melts and the top is lightly golden, about 20 minutes. Remove from oven. Stir the hot mixture with a wooden spoon to evenly distribute the melted chocolate chips. Set the mixture aside to cool down enough where you can comfortable handle it with bare hands. Spread the chocolate sprinkles on a large plate and set aside. Prepare a sheet pan with parchment paper and set this next to the sprinkles. Scoop out a tablespoon of the warm (not hot!) mixture and shape into a ball, then quickly roll into chocolate sprinkles (pressing down to help them adhere), then place on the prepared sheet pan. Work quickly, as the sprinkles will not adhere to cold brownie bites. Also, be careful not to crush the bites as they are somewhat delicate while they are warm. Once all of the bites are rolled in sprinkles, take a pretzel stick and break (or cut) it in half. Insert the pretzels into the bites to create the spider legs. Repeat until all of the bites have 4 pretzel legs. Allow the bites to cool off completely, 30-45 minutes, then use the royal icing to adhere the candy eyeballs to the bites. Set the bites aside so the eyeballs can dry. These brownie bites will keep for 3 days, if stored in an airtight container. They may become dry and hard after that, so it's best to enjoy them while they are fresh! *To make the cookies crumbs, simply pulverize a few cookies at a time in a food processor until you reach your desired amount. These are absolutely adorable! Love how cute they are, and I am all for anything brownie! May have to try these even though Halloween was last week!! 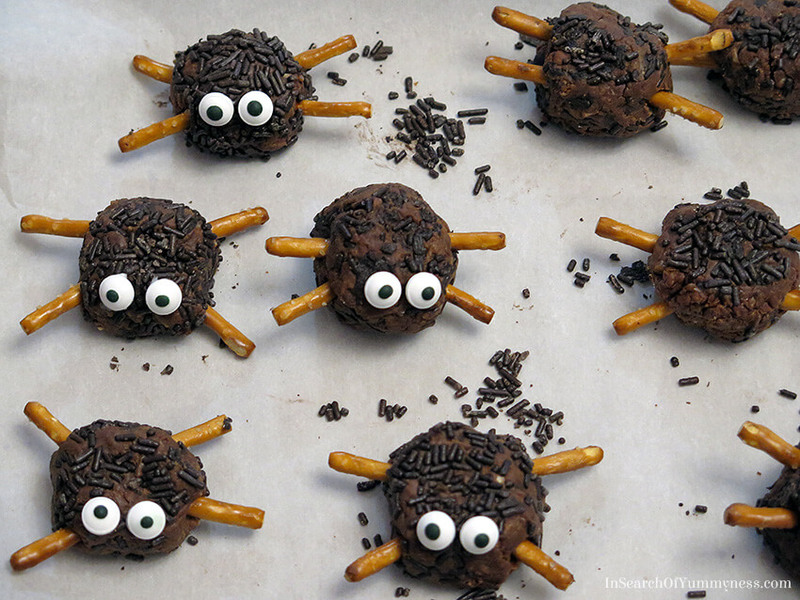 I’ve realized that while I may hate spiders, I LOVE these adorable spider brownies! I have some leftover eye candies from another recipe I made last week so this will be the perfect way to use them up! I was going to say that you could totally use leftover eyes from your candy bark! LOL! I’m the same way with spiders. Can’t stand them in real life, but I love cutesy ones in like cartoons and stuff. I don’t know why!